Hi Vicki-Ann here for Helmar today and I have been raiding our wood box again. We have a wood fire and we get wood off cuts from a friend who builds staircases. When the wood gets inside I am always finding bits that I want to paint on. This time it was these thin strips of wood. They are approx 8 3/4 inches, (22 cm) length by 1 inch, (2 1/2 cm) wide. They are quite thin about 2 mm. First, I sanded the edges and then it was just a layer of Gesso and I was ready to let my imagine take over as to what to put on them. I painted a tree on one and then I drew 3 owls on book paper and painted the inside of the drawing, cut them out and used my Helmar Decoupage and Craft Paste to glue them on the branches of the tree. Then when this was dry I drew the faces and outlined the owls. I painted the cat and flowers adding a little bit of stenciling for interest on the background. For the third one I painted the background then used my Helmar Decoupage and Craft Paste to glue some music paper and some half circles of book paper on top. Then I doodled around the book paper to make flowers. I filled in the petals with white Gesso. I then got the fan brush out and did splatters (fun stuff) with watered down white Gesso on 2 and added black Gesso splatters to the flower one. I sealed them all with 2 coats of Helmar Crystal Kote Matte Spray this keeps them sealed and protected from fading, yellowing and dust. You could use these for bookmarks of pop them around in places to add a bit of art here and there. They will make great little art gifts for friends. I have a few more that I am going to make they are such a fun size to paint. You could also drill a hole in the top and add twine to hang it on the wall. I think this project could also work well with wooden paint stirrers that you can get in some Hardware stores. This is Jean and I am happy to be spending a few minutes with you today as we talk about protecting our work. Do you scrapbook? How many of you make art journals? Have you made mixed media canvases? Did you know that over time your works will gather dirt and dust, fade, and even yellow? Do you want to preserve these projects and memories for your family and friends? I know I do and I now protect my works with Helmar's Crystal Kote Matte Varnish. This easy to use spray protects from dirt, dust moisture and discoloration. The matte finish dries clear and you can't even tell it is on the project. Here is a short video demonstrating Crystal Kote. To be honest, I have not been using anything to protect my scrapbook layouts. I now spray them before putting them in the plastic sleeve. I like that there is both a Matte and a Glossy finish. I tend to use the glossy for more of my canvases. Here is a link to Helmar . I hope you give the Crystal Kote a try! Be sure to follow us on Facebook for more information and inspiration! Helmar is a recognized leader and manufacturer of adhesives, aerosols and liquid products in a wide variety industries. We are looking for new additional Creative Team members to help showcase & promote our amazing products. Member positions on the Helmar Creative Team are for a 6 month period beginning October 1st, 2016. Receive a generous amount of Helmar products. Connect with other people in the hobby. Fingers crossed, you may possibly receive a selection of products from our generous Preferred Partners throughout your term to create with (subject to availability). DIY, quilting & sewing, etc. using Helmar or similar products. Please submit your application to socialmedia.coordinator@helmar.com.au by Monday 12th September 2016. This only gives you about 2 weeks to get submissions in! (No late submissions will be accepted). My first project is a little bag to put inside gift cards or certificates. I made this using decorated paper from a special wedding collection of papers from 7gyspies, it this Harmony Collection: Social Profile. I cut the bag using the Mini Treat Bag Thinlits from Stampin Up and to adhere this I used the Helmar Quickfix Adhesive Runner. For the decoration I used a sentiment Mr & Mrs from the stamp set Wedding Wishes from Joy Clair. I stamped it with Versamark and then emboss it with Silver Embossing Powder over a circle of card stock. I cut the circle and a doily in half and assembled this together using Zapdots. Then I pasted a piece of ribbon over the paper bag using Helmar Premium Craft Glue. 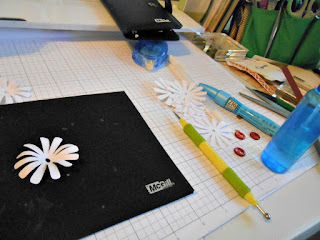 I glued the decorated half circle with Helmar Craft & Hobby PVA Glue and I finalized the decoration by adding a flower that I pasted with Helmar Premium Craft Glue. As a final touch, I added a strip of mini pearls. Creating this is very simple. After making the score lines on you paper, just take a punch and cut half of this on one of the sides. I used an oval punch but you can use any form of punch. 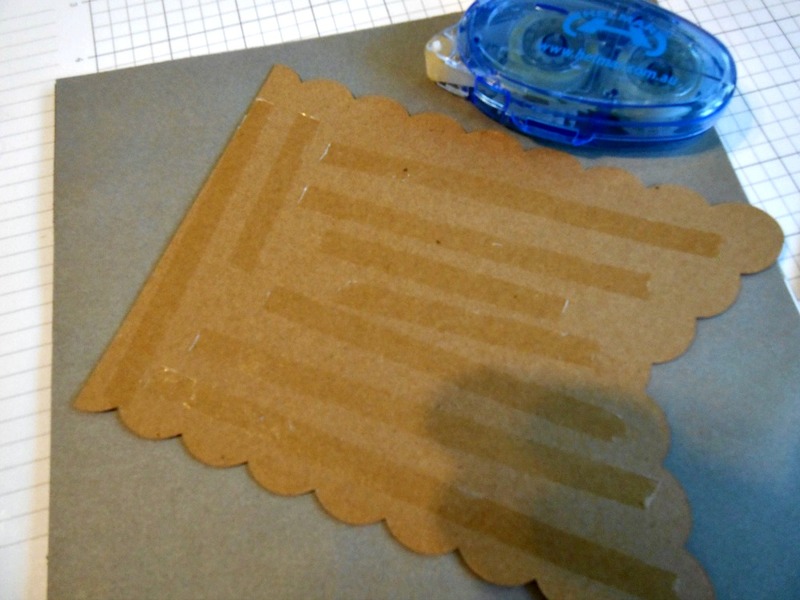 Then paste the upper and lower part of the punched side over the center panel of the package. I used the Helmar Craft & Hobby PVA Glue for this. Cut 2 strips of other colors of card stock of 3-1/2"x7 and 3-3/4"x7". I used Crumb Cake for the first size and Pool Party for the second. Put one piece over the other and paste only the left border. Mark with your paper trimmer a score line in 2" and create a belt around of the package. Secure it with Helmar Craft Hobby PVA Glue. Tie a ribbon around of the belt and to finalize the decoration, you can stamp the sentiment. I used a combination of two images of the stamp set Song of Solomon and Wedding Sentiments from Joy Clair, stamped with Versamark and then embossed with Gold Embossing Powder. I cut the image with a square framelit and tied it with linen tried. My third project is a package to carry money. I created this using silver metallic card stock. The size is 7"x8-1/2" with score on the short side in 3-1/2". I cut this from the entire page of 8-1/2"x11" and I used the leftover paper to create the additional pieces to decorate the front and create the holder part. Create the bow using simbinding ribbom and a piece of lace. Paste over the original piece of ribbon using Helmar Premium Craft Glue and paste a flower using the same adhesive. Stamp your sentiment and create a layer for this. I used a message from the stamp set Wedding Wishes from Joy Clair. 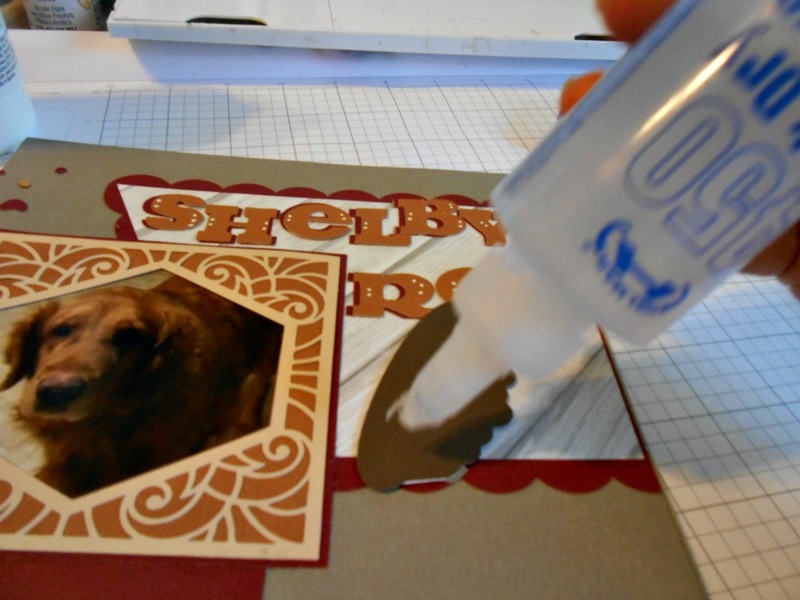 Glue the message using Helmar Quickfix Adhesive Runner. Cut other piece of 3-1/2" in width from the leftover piece and create two triangles from this. Paste the laterals of these over the interior part of the money holder; these will keep your money in place. To paste these you can use Helmar Quickfix Adhesive Runner. I hope my packages inspired you. You can use these ideas for any occasion; just change the colors and stamp themes. Greetings, craft fans! Jennifer, here, with a cute solution for any beleaguered tooth fairies out there. Losing baby teeth is a rite of passage all kids go through and, to lessen the pain and/or trauma of change, the tooth fairy comes and leaves a gift in place of the tooth. Being a tooth fairy is tough work, though: light sleepers, pillows that hide the teeth, and the need for exact change. Today's project is a tooth fairy pillow that'll make the transaction much smoother (and cuter); the change thing is on you. Trim the fabric to fit the width of the die cutting machine and cut 2 pieces for the body of the pillow from the patterned fabric and the embellishments from the solids. I used a mix of linen, quilting cottons, and lightweight fleece, all of which cut beautifully in my Sizzix Big Shot Plus with the Sizzix Big Cuts, Thinlets, and Spellbinder dies. Treat the edges of the cut pieces--all of which will be exposed--with Helmar Fray Stoppa to prevent fraying and add a little stability to the edges. All to dry. 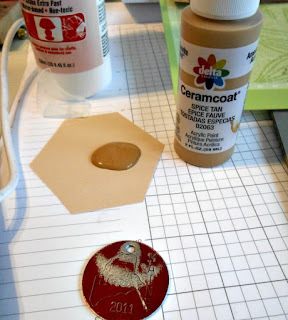 I had no problem with the Helmar Fray Stoppa leaving any lasting color change on my fabrics once it was dry, but it's always a good idea to test on a scrap piece so you'll know. Tie small bows with the ribbon and treat the cut ends with Helmar Fray Stoppa, as well. A pocket is key to the function of the tooth fairy pillow, and labeling it never hurts. Use fabric markers (or embroidery) to label the pocket segment. In my case, I had this cute mason jar die set (Country Charm by Spellbinders) that included a label that was perfect for a pocket. Stitch the pocket to the background with a back stitch along three sides. Spray the backs of the base pieces and one side of each of the batting layers with Helmar 101 Quilt Basting Spray. This is a temporary, repositionable adhesive that holds everything in place while you stitch. I use a small box to spray in to avoid over-spray on my work surface. I'm using the largest of the Square Swatches Spellbinder dies that's right around 4" wide, so my batting is cut into 3" squares and I'm using three of them per pillow. Also spray the backs of any decorations that will be completely attached to the pillow (in my case, that was the mason jars, and the heart for the tag). Stack the layers for each pillow (pattern-side-down base fabric, batting, pattern-side-up base fabric, decorations) and match edges and corners. Sew the layers together, back-stitching around any decorations on top and around the perimeter of the pillow. Attach any decorations (like the flower or tag show in my examples. And there you go! With the tooth safe in the pocket of the pillow, the tooth fairy can easily find it and swap it out for the gift! Happy Friday to you all and Happy National Dog Day! Today I am posting for Helmar, and also celebrating National Dog Day. In doing so I want to do a project memorializing our Golden Retriever of 11 years..Shelby (fondly called Shelbyroo) who passed away June 7th of Cancer. What I decided to do was redo an 8 by 8 shadowbox picture frame, which previously had Christmas decor inside. I started by ripping off the old decor and paper. The next thing I did was get one of her older license tags and repainted it to match my project colors, and set it aside to dry. 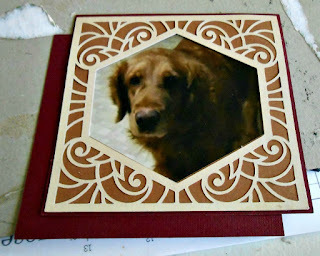 Next I found the picture of Shelby I was going to use and matted it with a cut I got from my Cricut machine. I used Helmar Acid Free Glue so as not to ruin the photo. I used the Helmar Super Tack Glue to add the cardstock to the chipboard frame. I created a banner for the background and used the Helmar Permanent adhesive runner. I made some 3 dimensional paper daisies. I cut them with my Cricut machine, spritzed with water and molded with the different sized styluses. I joined 3 in layers and added a button for the centers. For adhesive for the flowers and the dog dish image I used Helmars' 450 Quick dry adhesive. Finally assenbled all the pieces and took the finish frame outside by what used to be her yard and took a picture. Sure do miss her. she was a wonderful dog and a member of the family. Good Morning! Jean here and I have to be honest. I have some art ingredients that I have not used. I think I was intimidated and not sure what to do with them. Well, it is time to fix this! I decided to see what happens when I mix Glass Glitter and Glass Beads with Helmar Decoupage. Let's take a look at my process. Using a recycled meat tray, I mixed the Decoupage with the glitter and beads. The paste was thick but still easily workable with a stencil. I thought I could make embellishments with the glitter leaves. The beads created an amazing background for this card. Once dry, I misted the feathers and background. I cut the feathers and used them with flowers and a heart to create a cluster for this card. Gemstone Glue was perfect for gluing more beads to the flower centers. Don't you love the texture of this? Look how easy it was to use these art ingredients. So who else is out there hoarding glitter, beads and more? Dust it off and mix it up!!! Thank you for joining me as we play with Helmar Decoupage! Hi Veronica here today to share with you an old frame that I restored. This frame was originally cream with a gold trim. I repainted and distressed the frame with a tint of light and dark grey. This time I gathered lots of supplies because I really didn't know where this project would take me. 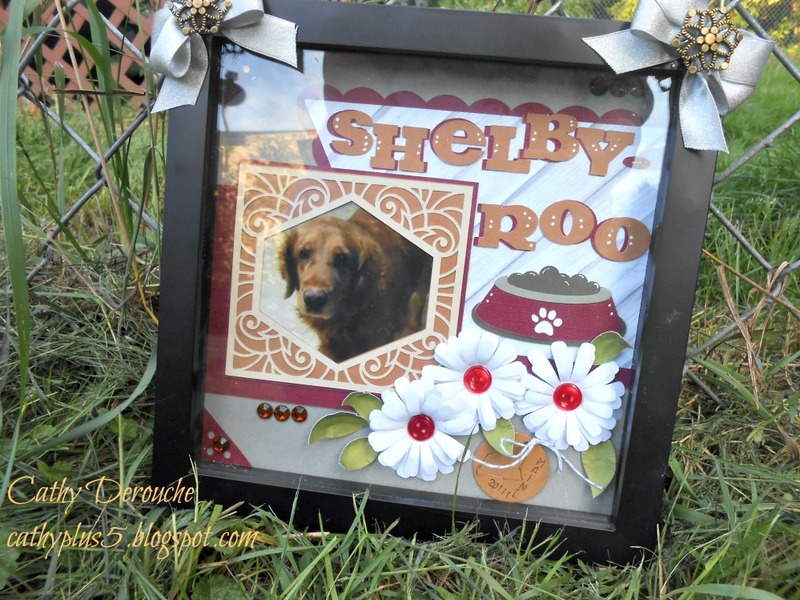 I knew that I wanted to make a baby frame to gift to my neighbors new grandchild; but that's all I had in mind. My first step was to redo the base matt. Though I did use the opening for a 4x6 photo as a template. I also fussy cut the embossed frame that was on the original matt. I tinted the mat border with a light grey before adhering it to the new base. Next I mixed some mica chips and gesso to tint the original cream frame to a light grey. I like the new color of the frame and it will match the baby's room. My neighbor let me know that her grandchild's room is done in greys and with baby elephants. I found this adorable elephant button and it was perfect as a center on my flower. 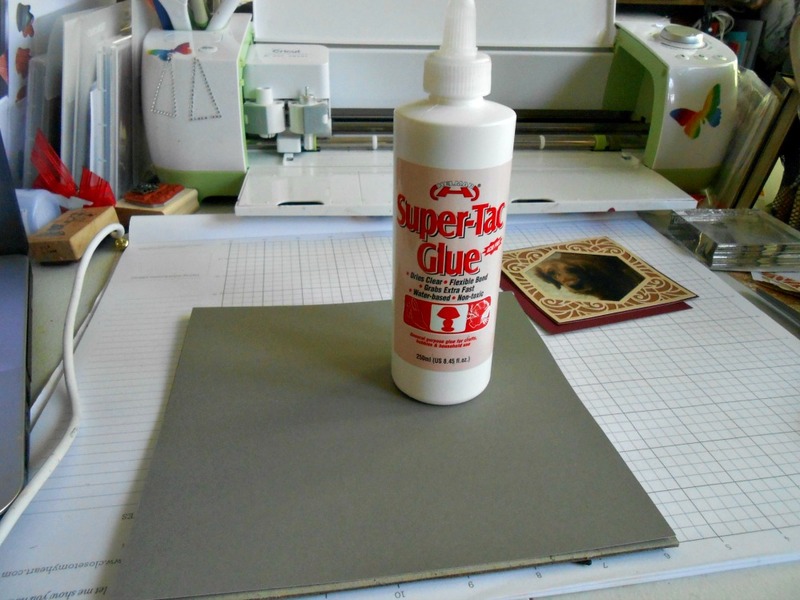 The Helmar Craft Glue works perfect for this. The last thing I did was embellish the outside of the frame. I love this look, especially since I love layers and texture! I hope you enjoyed my little project. So look around your home, take something old and make it new again! Hello everyone. I have never, I mean never, made a scrapbook page before so bear with me on this LOL. First of all, I forgot to take pics as I was making it because I was so engrossed with it. I had no idea what to do. I did watch a ton of videos on Youtube but still did not know how to get started so. I just went for it. Just go for it.......that is the best advice I can give. I am the middle child from a family of 9 children. I have 2 older brothers, 2 older sisters, 2 younger brothers and 2 younger sisters. Here are a few photos of the page. This photo is of myself and my remaining brothers and sisters. We lost our 4th oldest (sister) at the age of 33. I attached the photos using Helmar Adhesive Tape Runner. The tags were added using Helmar Zapdots. This is a photo of her. She is still in every conversation we have when we have get togethers. It is like she just couldn't make it to the function. Here are the names of all of us. I used the tape runner to attach the sheet with the names and another Zapdot to attach the flower. And here is the final picture. For the borders and other scrap pieces of paper, I used Helmar Decoupage Paste. Thanks for stopping by and don't forget to check out all of the Helmar products here. Hi. This is Jean and I want to share with you a trending technique I have noticed recently on layouts. 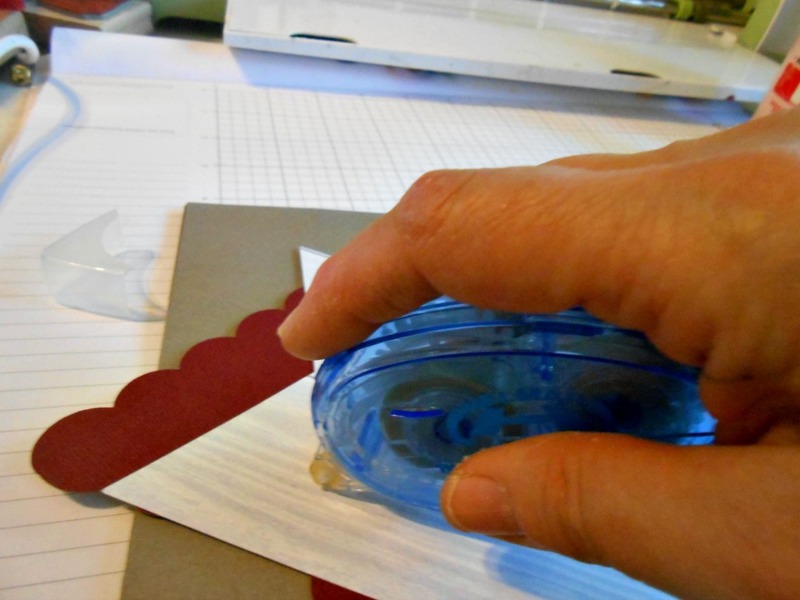 This technique involves cutting and rolling strips of paper. You can do this to create a border or to "reveal" something underneath. I thought this would be a fun way to "reveal" the typography on this background paper. I started by positioning my striped paper over the typography paper. I measured where I wanted my window opening to be and cut the flap. Once the window looked to be in the perfect location, I tightly rolled the strip of paper securing it with Helmar 450 Quick Dry Adhesive. I held it for just a little until it was set. I proceeded to make three windows using this technique. I also used the 450 to secure the flowers, buttons and other embellishments on my layout! Scrapbook sketch courtesy of DCWV. Have you seen this? Have you tried it? I hope I have given you an idea of how easy this is to do! Please be sure to visit us on Facebook for more inspiration and to share your projects with us! We love seeing how you use Helmar products! !